Inuktun Sighting #129: Follow the Leader — Inuktun Services Ltd.
Industrial leader Dow Chemical Company has been no stranger to Inuktun’s blog, and today’s #InuktunInTheWild sighting features demonstrations hosted at their Kentucky and West Virginia facilities. 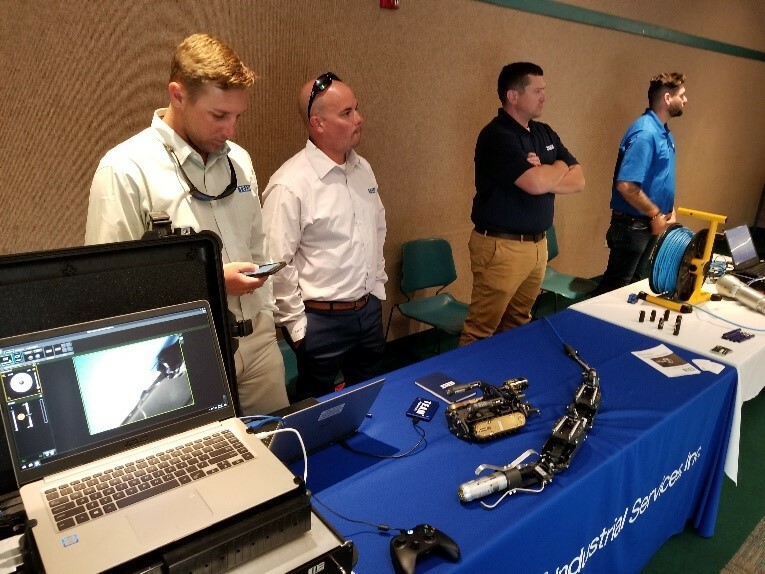 Inuktun InCommand Robotics’ (IIR) Sales Manager, Sam Perez, participated in this robotic roadshow at Dow’s request to introduce IM3™ (Inuktun Multi-Mission Modular) technology to over 150 Dow maintenance and reliability operations personnel. Dow organized the event to further its ongoing initiative to eliminate confined space entries (CSEs) by the year 2025, and key to this goal is Dow’s continuing acquisition of select robotic systems capable of remote visual (RVI) and nondestructive testing (NDT) inspections. Nicknamed the “Dow Robotic Toolkit” by Inuktun’s engineering team, it was defined by a simple philosophy: Employ flexible robotic components to perform myriad operations within Dow’s facilities in pursuit of the elimination of CSEs. As industrial leaders like Dow demand greater remote inspection capabilities, IM3™ technology offers the ideal solution for minimizing human and environmental risk while promoting production efficiencies and cost effectiveness. The 'Dow kit' is already in use at several plants around the globe. It offers an all-in-one solution for adapting to the varying environments inspectors face. The kit includes the Spectrum 120HD™ high definition pan, tilt and zoom inspection camera, MaggHD™ high definition miniature magnetic crawler, MaggUT™ ultrasonic testing miniature magnetic crawler, Versatrax 100™ Mark II miniature pipe inspection vehicle, and the Crystal Cam® Delta Extreme inspection robotic crawler by sister company, Crystal Cam Imaging Inc.
Have robots, will travel. If you’re ready to see how IM3™ technology performs in the environment you work in, contact our global team to setup an onsite product demonstration. Or dig into other use cases featured in our #InuktunInTheWild blog segment to see how other inspectors are getting the most from their robotic crawler and inspection camera systems from Inuktun. And as always, we want to see YOUR photos and videos of our gear working in the field. Send them to the editor for an opportunity to be featured on Inuktun’s blog now!